The Filtoclear range of filters is a highly developed range of pressure filters designed with ease of use and quality filtration in mind. Innovative, effective pressure filter range with integrated UVC-clarifier-9 watt. Extremely user-friendly thanks to "Easy-Clean-Technology" Featuring a valve that allows cleaning without taking it apart, a clever handle on top which allows you to compress the foam layers to remove sludge from the filter. 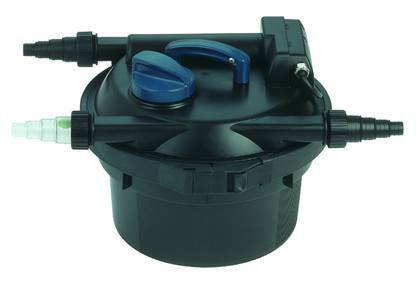 Suitable for ponds up to 1500 litres.